The 2018 Ford Mustang rolled into showrooms this fall with more of what pony car enthusiasts want most: more power, more technology, and more choices to make any Mustang their own. The new Mustang features a more athletic and more modern exterior design that includes a lower, remodeled hood and grille for a meaner, leaner look, and a new front splitter for improved handling and improved fuel economy. Mustang GT’s legendary 5.0-liter V8 engine packs more horsepower and torque than the outgoing version, and a long list of performance and technology upgrades – including an available 10-speed SelectShift®automatic transmission and new Drag Strip mode for maximum straight-line acceleration – that make Mustang more track ready than ever. Technology and design changes give owners new options to personalize their Mustang, highlighted by the available all-digital instrument cluster. Created in part by ex-video game developers, Ford’s first 12-inch all-digital LCD instrument offers various screen layouts, 26 color options and displays for up to eight gauges. The screen can be easily personalized, offering different views for normal/snow/wet, sport, and track/drag modes. Drivers can use new Mustang MyMode to save their favorite settings for suspension and steering and exhaust note preferences. Premium trim level features give the interior an enhanced look and feel, with a hand-stitched wrap for the center console armrest, a look that is mirrored across the instrument panel and down the sides of the center stack. Restyled seating surfaces feature new patterns and color choices, including tan, Showstopper Red, Midnight Blue with Grabber Blue accents, and Ebony with Alcantara® suede accents. A pulsing start button glows red at night before the engine is started, and the instrument panel sports an updated Mustang badge. A heated leather steering wheel is a first-time option for Mustang drivers. The rear of the car gets revised LED taillamps for a more technical look, plus a new bumper, revised styling and available performance spoiler. A dual bright exhaust is standard on EcoBoost-equipped models, while Mustang GT gets a standard dual exhaust with quad-tips. With a dozen available alloy wheel designs and 11 available exterior color choices – including all-new signature Orange Fury metallic tri-coat and Royal Crimson, as well as the return of Kona Blue – enthusiasts can be sure to capture the look they’re after. Performance is at the core of Mustang DNA, offering drivers a unique thrill of acceleration and cornering for the ultimate fun-to-drive experience. On all models, new shock absorbers make for better ride control, a new cross-axis joint in the rear suspension leads to increased lateral stiffness, and innovative stabilizer bars bring sharper response and handling. MagneRide® active suspension is a new option with Performance Pack – and standard with Performance Pack Level 2. The active damping system uses sensors positioned around the vehicle to adjust the suspension based on various inputs, including speed, steering angle, brake pressure, lateral and longitudinal acceleration, engine torque, drive mode selection, and even outside air temperature. The proven 2.3-liter EcoBoost four-cylinder engine continues to offer outstanding performance, and improves to 310 horsepower and 350 lb.-ft. of torque. The 5.0-liter V8 engine on Mustang GT has been thoroughly reworked; with 460 horsepower and 420 lb.-ft. of torque, it is more powerful and revs higher than any Mustang GT before it. 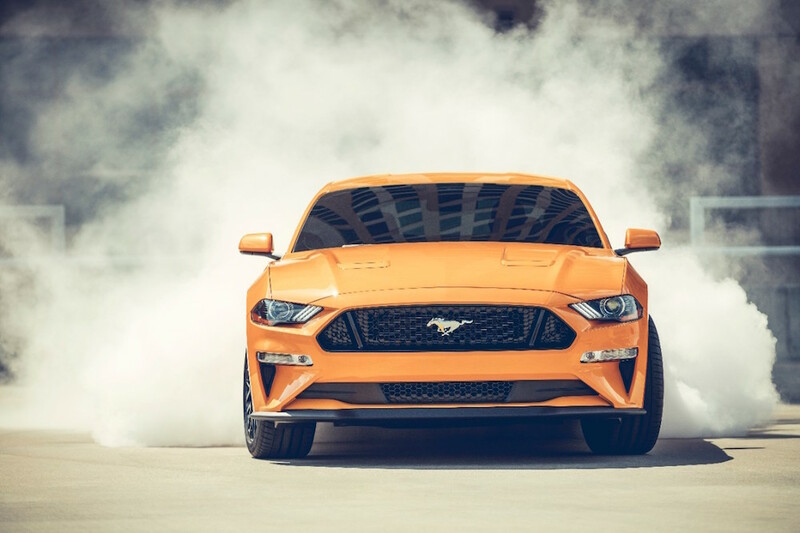 The power increase was achieved with the first application for Mustang of Ford’s new dual-fuel, high-pressure direct injection and low-pressure port fuel injection on a V8 engine – delivering robust low-end torque, high-rpm power, and improved fuel efficiency. EPA-estimated fuel economy ratings for EcoBoost-equipped Mustangs with an automatic transmission are 21 mpg city, 32 mpg highway, 25 mpg combined. Manual transmission models are rated at 21/31/25. Mustang GT is rated 16/25/19 (automatic transmission) and 15/25/18 (manual transmission). Actual mileage will vary. The manual transmission for both engine options has been upgraded for improved torque. For the V8, the manual transmission has been completely redesigned to include a twin-disc clutch and dual-mass flywheel to increase torque capability and deliver more efficient clutch modulation. A new 10-speed SelectShift® automatic transmission, available with both EcoBoost and V8 engines, is the best automatic Mustang has ever offered. With a wide-ratio span and optimized gear spacing, this all-new gearbox helps deliver higher average power for acceleration – improving responsiveness and performance. Track drivers will find electronic line lock standard on both V8 and EcoBoost-equipped models. The feature lets racers pre-warm their tires before the start of a race for better grip. Complementing the feature on vehicles equipped with a 12-inch all-digital cluster is an industry-first video game-like animation of a spinning alloy wheel kicking up a cloud of smoke when line lock is activated and engaged. The 2018 Mustang will also be the first North American production car to feature the newest high-performance Michelin Pilot Sport 4 S summer tires. Designed to improve wet grip, dry grip, braking and handling, the Michelin Pilot Sport 4 S tires are available as part of the Mustang Performance Package. Enthusiasts will find a new level of fun when Mustang Performance Pack Level 2 becomes available in the spring of 2018. The package includes a collection of drive-enhancing components such aerodynamically balanced high-performance splitter and rear spoiler designed to add downforce and enhance driver confidence when attacking curves at high speed. Owners of a new Mustang can even adjust the car’s sound to their liking. Using the available Active Valve Performance Exhaust System, drivers can choose from normal, sport, track and quiet modes. The system includes an industry-first, time-configurable Quiet Start function, which lets drivers schedule times of day – such as early in the morning when neighbors are sleeping – to turn down the volume of the 5.0-liter engine’s roar. For the first time, Mustang features a number of Ford driver-assist technologies, including Pre-Collision Assist with pedestrian detection including Distance Indication and Automatic Emergency Braking, Lane Keeping System, and Driver Alert System. The driver assist systems use radar and cameras to recognize objects in the road, and may take autonomous emergency action – such as braking – to mitigate or avoid a collision. The entire Mustang line features all-LED front lights including signature lighting, low-beams, turn signals, efficient projector high-beams and available fog lamps. Mustang drivers can now enjoy the convenience of Ford SYNC® Connect. The available feature gives drivers the ability to use the FordPass™ smartphone app to start, lock, unlock and locate their vehicle, as well as get updates on various vehicle diagnostics such as fuel level. New, with a sleeker design, more advanced technology and improved performance, the 2018 Ford Mustang features a lower, restyled hood and grille, and new hood vents that give it a more athletic look. For the first time, the entire lineup features all-LED front lights, plus there are revised LED taillamps, new bumper, fascia and an available performance spoiler. Dual-tip exhaust is standard for Mustang EcoBoost®; V8-powered Mustang GT gets a standard quad-tip exhaust. A heated steering wheel is optional, while the standard rearview camera carries over. Available 12-inch, all-digital LCD instrument cluster offers unique displays for normal, sport and track modes. All-new MyMode lets customers save drive settings when ordered with the 12-inch cluster. The car’s engine note can be personalized with all-new active valve performance exhaust, available on Mustang GT. Pre-Collision Assist with Pedestrian Detection, distance alert, lane-departure warning, lane-keeping assist and Driver Alert System are available driver-assist technologies. SYNC® Connect with FordPass™ is available for the first time. New shock absorbers, cross-axis joint on rear suspension and innovative stabilizer bars deliver an improved ride on all Series. MagneRide dampers are a new option with Mustang Performance Package. Standard 2.3-liter EcoBoost delivers increased torque, while thoroughly reworked 5.0-liter V8 brings improved horsepower, torque and fuel efficiency. Redesigned manual transmission for Mustang GT features twindisc clutch and dual-mass flywheel for increased torque capability and more efficient clutch modulation. New 10-speed automatic transmission – available for both engines – delivers quicker shift times, better low-speed tip-in response and significantly reduced friction losses.